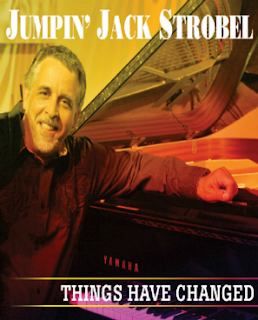 I just received the newest release, Things Have Changed, from Jumpin' Jack Strobel. Opening with Mother Earth, a Memphis Slim track, Strobel takes a very earthy approach, exhibiting extreme dexterity and creativity on the keyboard. Listening to this track it's hard to believe that it is the same track as performed by Gov't Mule. Backing vocals by Layonne Holmes, Ricky Laurie Collins and Big Joe Fitzpatrick add a particularly warm richness. Next up is Dylan's Things Have Changed with a jazzy Latin beat. I particularly like the low fretboard guitar work on this track. On Get On The Right Track Baby, Strobel gets a good polished delivery of a Texas swing track. Andy Riedel plays some tasty swing guitar riffs adding some sparkle to this swinging track. Strobel again steps up with dazzling key work and Steve Brown (drums) and Mike Lamps (bass) are tight on the bottom. On I Don't Want To Know, Strobel keeps the driving swing going with dominate piano riffs and stirring bass. Strobel has a solid voice and the arrangement is strong. On New Orleans Blues, Strobel really digs in on the piano and is followed closely by a super tight solo with great style and texture by Riedel on guitar. Amos Milburn's Bad Bad Whiskey is a great choice for this release. With a strong swing and beautifully articulated guitar work, Strobel sings and plays up a storm. Great track! Duke Robillard and Al Basile track You Mean Everything To Me has a Latin Beat and both Riedel and Stroebel play cool riffs on this smooth blues/jazz track. A new and different take on Dylan's Don't Think Twice is refreshing with soul and gospel overtones. Backing vocals by Holmes, Collins and Fitzpatrick add considerable richness and honestly the track is barely recognizable as the same track upon casual listening. Little Walter track Up The Line is a great finisher for this release with Riedel leading the way with stinging guitar leads. Strobel closes the door with dazzling key work. Sorry but no video found.